Genesis begins with: “First Elohim created (completed action verb) the heavens and earth.” The next verse starts with the Hebrew waw, as do most sentences in Genesis One. (The waw serves as a conjunction like an “and,” “then” or “but.” And the earth she-was (completed verb) formless and empty. How did the formless Earth receive form? Elohim’s wind dithered in unbroken continuity above the dark, primordial surface as He continued to command light to continue to be. Indeed, light never stops dithering around within matter, giving it extension and other properties. Light dances around within all matter. Indeed, matter is a relation with light. 85% of the Hebrew verbs used in the next six days show continuing actions (imperfect, participles and infinitives). These verbs show that God continued to change what He first created (formless matter). Even on day seven, the verbs for finishing the heavens and the earth are imperfect showing that the intensity of creation was complete, yet the finishing continues. This makes no sense to westerners who reference actions to “time.” It is not a contradiction in tenseless biblical Hebrew. There is no mention of an actual time in Genesis One, only evenings, mornings and days. In a language that uses verb tenses, one categorizes events into past, present and future time. In ancient Hebrew, events were referenced to other events or to the season of something in nature, but not to time, which had no actual existence in their world view. Evenings, mornings and days are phenomena observed in nature. Western ideas about time are subjective since no one has ever observed any time. Perhaps the reason the ancients had no present tense is that they did not hurry through life, controlled by clocks. Job 14 explains what it was like living in the dinosaur age, when men lived for few days. Job describes geological phenomena: the sea (west) dried, water wears away rocks and carries away the dust of the earth – that passed during those few days. Indeed, the Mediterranean dried repeatedly and the Nile was once a narrow gorge, deeper than the Grand Canyon, incised in granite. Today it is silted up into an enormous delta. Job 14 ends with the claim that their faces changed (doubled) before they died. The bones of the skull are the only part of our skeleton that keeps growing as we age. If we observed geological phenomena (such as a drying ocean) in one lifetime, we would grow Neanderthal brows from vast age. This skull of a Neanderthal old man was found at Gibraltar. Image was uploaded to wikipedia by user AquilaGib and is in under a CC 3.0 license. However, our grandchildren would not have the extended brows of the old ones, as the Neanderthal fossils show. Job does not mention time, only eon-events in his shortness-of-life poem. He does mention that he expects to see his redeemer with his own eyes in the resurrection (Job 19:23 – 26). If you wonder how could days and years continue to accelerate, with respect to former days and years – not time, consider gravity aberration, which you can read about on this website. Augustine imagined that Genesis 1:1 was referring to the beginning of time. Modern Christians wonder if the creation days were 24 hours long or vast eons of time. Conjecturing about creation with western time ideas is unsupported by the Hebrew grammar. The creation events occurred in a specific sequence of evenings and mornings (as the text shows), yet natural geological events occurred during those evenings and mornings. A spreading atmosphere separated water above the atmosphere (that evidently formed into ice Proverbs 8:28) on day two. Perhaps this was similar to the surface jets forming an ice ring around the moon Enceladus. Then surface waters seeped into subterranean seas so that the dry land appeared. Then vegetation grew into trees that reproduced during the latter part of the third evening and morning. These geological events are followed by astronomical phenomena. Beginning on the fourth evening and morning, Elohim continues to form the Sun, Moon and stars and continues to make them into spreading things (raqiya). In unbroken continuity, He calls the stars to come out, yet none go missing (Isaiah 40:26). The universe may contain more than a trillion galaxies in all directions and many ranges. The most powerful evidence for a literal creation is visible cosmic history. We observe the stars continuing to form and spread out from unformed matter at the core of countless galaxies at many ranges. What we observe only fits the literal creation text. Indeed, the Bible says knowledge is available to all is in the plural heavens, the things that spread (raqiya). You can read the literal seven days of creation on this website. 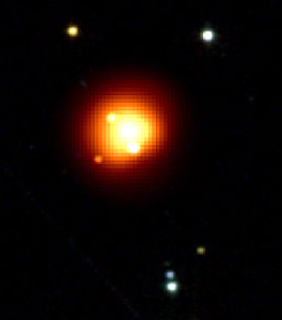 The image shows Gamma Ray Burst GRB-080913 from NASA. Gamma ray burst are the most intense light ever observed. They shine from the earliest eras of the universe.